The 2011 USCL season is over, with the NY Knights winning in the finals against the Chicago Blaze (both teams fielded less than optimal lineups because of tournament conflicts). For me, the 2011 campaign was a return to chess after a full year away from OTB chess and two years away from the USCL. I got off to a great start, beating GM Melik Khachiyan when my main hope was not to embarrass myself, but my play was somewhat uneven. Some weeks I played well (that game and the game against Shulman), while on some weeks I was out of it (like against Amanov). Part of that was probably due to me not working on chess in between matches, so I never got into a groove. The games felt a lot more tiring than I remember then being, and I imagine most of that it because I’m not used to playing long chess games anymore. One of the interesting things about this year was that in 4 of the 5 games, I played something totally new. In the first game against Khachiyan, I had played a few games from the black side of the Giouco Pianissimo (and many more from the white side). After that, though, I played a totally new line of the French (and was playing it well for a while) followed by the Nimzo a couple times and a Slav/Grunfeld hybrid against the Reti (that didn’t work out so well …). I have played 1.d4 Nf6 2.c4 e6 in a few rated games before, but the “threat” of the Nimzo seemed to be too strong and I never actually faced 3.Nc3. Instead after 3.Nf3 or 3.g3, I played 3…d5. This year, though, both Shulman and Bercys chose 3.Nc3 against me, clearly indicating that the “threat” of the QGD was too much! My score with the Nimzo now is 2.5/3, so I haven’t done too badly there. For the first round of the playoffs, we were facing the LA Vibe. As they finished just ahead of us in the regular season, they received draw-odds while we had color choice on board 1. Taking white makes sense mostly because having the white pieces is relatively more important for GM games, while Board 4 games tend to be more of a tossup. As an aside, with our season over, I think it’s safe to reveal a facet of the team’s strategy this year: maximize the number of whites for GMs Patrick Wolff and Jesse Kraai, and fit me in if needed. Thus, after Week 1 when I was in NY, every time we had black on board 1, I was in the lineup. Whenever we had white on board 1, I didn’t leave work early. It’s not that I’m so great with the black pieces, but I guess I don’t show as big a differential in results by color as many other GMs. Looking at my database, my performance rating for the past handful of years is only a couple points below my average rating for that time. Given that the standard performance “boost” for white or “penalty” for black is around 35-40 rating points, I guess I have done relatively better than average with the black pieces. If I have to win, it’s not ideal, but otherwise I also don’t really mind playing with the black pieces. So, with us having white on 1 and 3, the lineup that matched our color strategy was for all 3 GMs to finally play together with Uyanga Byambaa on board 4. I could play above Wolff, but then that’d break the color pattern, so our lineup was Wolff – Bhat – Kraai – Byambaa. 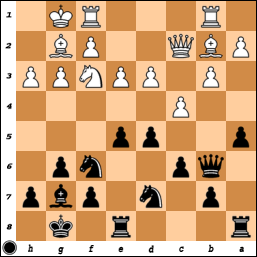 As black on board 2, I faced IM Zhanibek Amanov, who’s played all of 1.e4, 1.d4, 1.c4, and 1.Nf3 in the past few years. The full game can be seen at http://www.uschessleague.com/games/zamanovbhat11.htm. This is a general problem with Black’s whole setup – he isn’t really much worse at the moment, but he doesn’t have much to do while White can still improve his position. 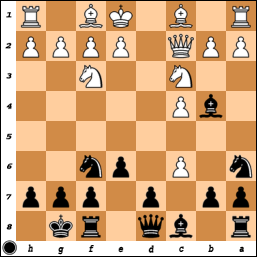 The e5/d5 center is nice but not particularly mobile, and Black’s pieces are largely stuck guarding those pawns. I had trouble coming up with a plan, and the result maybe was a bit artificial, but I think it was reasonable given the situation. Last year, when the San Francisco Giants won the World Series for the first time (they’d only won in their previous incarnation on the East Coast), the name of the game seemed to be “torture.” With an anemic offense and stellar pitching staff, the Giants made it a habit of making every game close. Often when it was an apparent blowout, they’d let the other team back in only to sneak out with a win in the end. This game was an (unplanned) homage to that spirit. The full game can be replayed here (http://www.uschessleague.com/games/bercysbhat11.htm). I saw that Bercys had played 3.Nf3 a bunch of times, but more recently he had been favoring 4.Qc2, so this didn’t come as a surprise. A welcome difference from my game with Shulman! Bercys repeated a line that he had played a few times before with 4…0-0 5.Nf3 c5 6.dxc5 Na6 7.c6. Morozevich introduced this move in 2008 against Ponomariov and won a miniature. He’s since played it a bunch of times with great results – 7/9 with 2900+ performance rating. Interestingly, the rest of the crowd hasn’t scored well with it – 50% and no performance rating bump for having the white pieces. Anyways, I think there are two reasons behind the move: (1) it’s relatively new, which is already something these days; and (2), it attempts to close the c-file as later on in the usual lines, the c4-pawn and Queen can be a bit exposed. The CEOs of the organization are GM Falko Bindrich and IM Tobias Hirneise. For those interested in some more info, here’s an interview with the ACO’s President, Lothar Hirneise. (permalink here). Can an Old Tiger Change His Stripes? term weight loss on Who’s Afraid of the Exchange Slav? Name on Who’s Afraid of the Exchange Slav? Daily Chess News Links November 10, 2013 – ChessCafe.com on Playoffs? Playoffs.